When canned Carnation Milk became available in grocery stores in approximately the 1940s, she read an advertisement offering $5,000 for the best slogan. 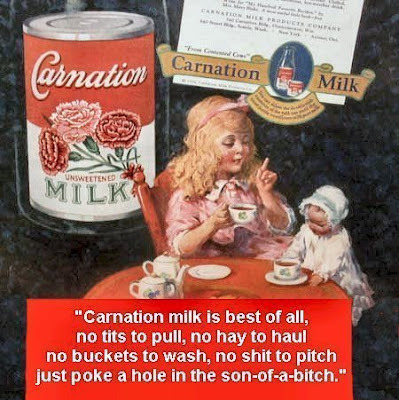 The producers wanted a rhyme beginning with "Carnation Milk is best of all." She thought to herself, I know all about milk and dairy farms. I can do this! She sent in her entry, and several weeks later, a black limo pulled up in front of her house. A man got out and said, "Carnation LOVED your entry so much, we are here to award you $2,000 even though we will not be able to use it!" Yep. It's a yarn, but still a cute (and accurate) slogan). Check out snopes for variations.